A spicy sweet twist to a cocktail classic! 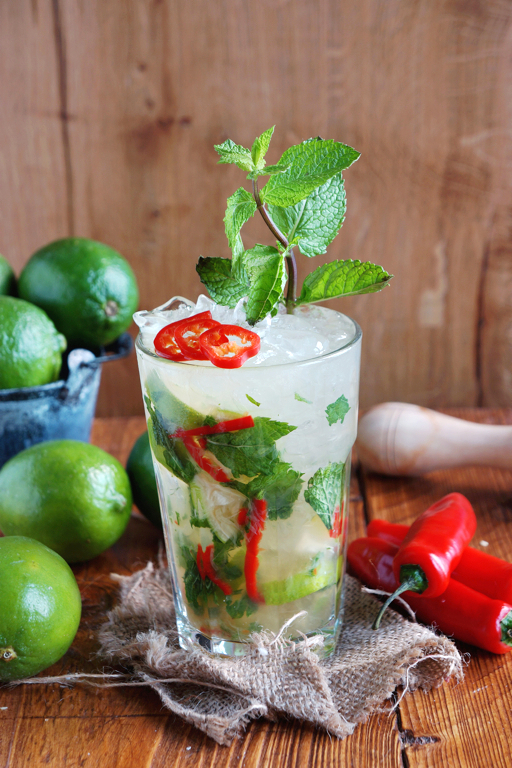 Most of us have enjoyed a few great Mojito nights (though not necessarily the morning after) but none of them will have tasted quite like this… a ‘Coconut Chilli Mojito’ is a tropical thrill in a glass. Just add friends. We first came across this cocktail at Galvin La Chapelle. Of course, Mr. B had to choose the most “girly” cocktail on the menu – a ‘Coconut Chilli Mojito’ (I opted for a G&T) – but this time, his pick was just perfect! I was swept away by the sumptuous blend of sweetness, sourness and spiciness… definitely one to experiment with at home! 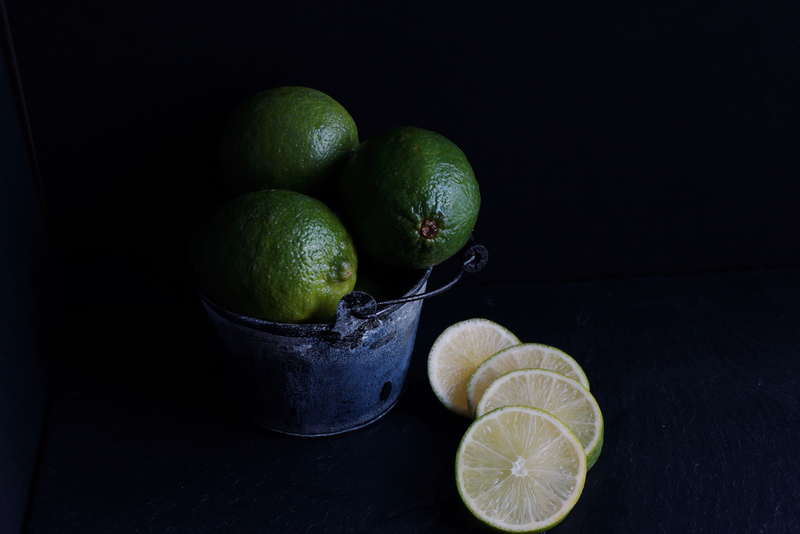 Add the lime, raw sugar and chilli to a sturdy highball glass. Muddle until the sugar is dissolved. Add the mint leaves and mash briefly. Add the Malibu and sparkling water. Stir. Fill up with the crushed ice and combine until well mixed. Tip: You might not want to add the crushed ice all at once so it’s easier to mix. Add straws and a sprig of mint. Exchange the Malibu and raw sugar for white rum and coconut syrup. If you have to make a few mojitos at a time, muddle the lime, raw sugar, chilli and mint in a bigger jar, divide between all the glasses. Proceed with recipe as above. Try this cocktail without mint, just add another quarter of lime instead. Don’t have any crushed ice handy? Try making it in your Vitamix or similar (it’s perfectly alright to have a mix of crushed and normal ice). Otherwise use normal ice cubes and add a bit more sparkling water. In need of a spicy kick? Add the chilli seeds as well. 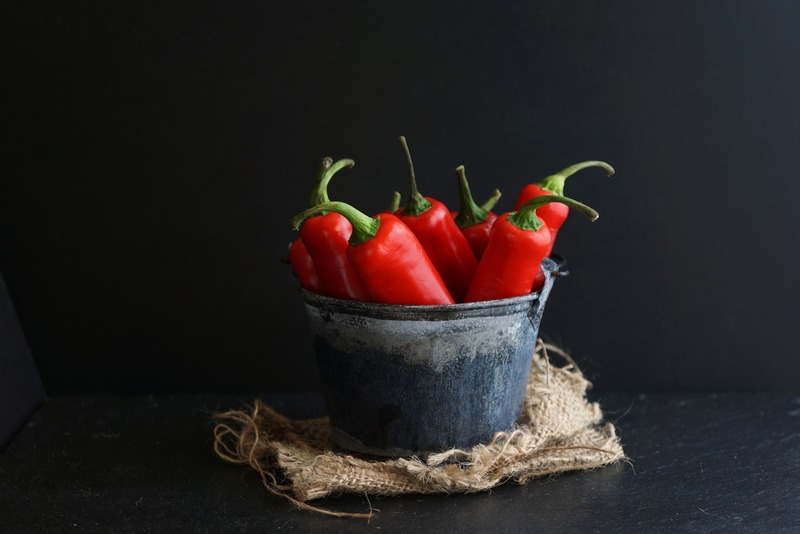 Capsaicin is the tastless, colourless and odourless active ingredient found in chilli peppers. It is present in large quantities where the seeds are attached to the white tissue inside the pepper, making it the hottest part of the chilli. When touched, it will produce a sensation of burning. While it does no lasting damage, hot chilli causes the body to release endorphins into your bloodstream – your very own opiate. The result is a natural high! This entry was posted in Food, Food Photography, Food Styling, Recipes and tagged drinks, photography, restaurant by Françoise La Prune. Bookmark the permalink. Even better, try Koko Kanu Jamaican Coconut Rum. Not horribly expensive but fantastic in these. 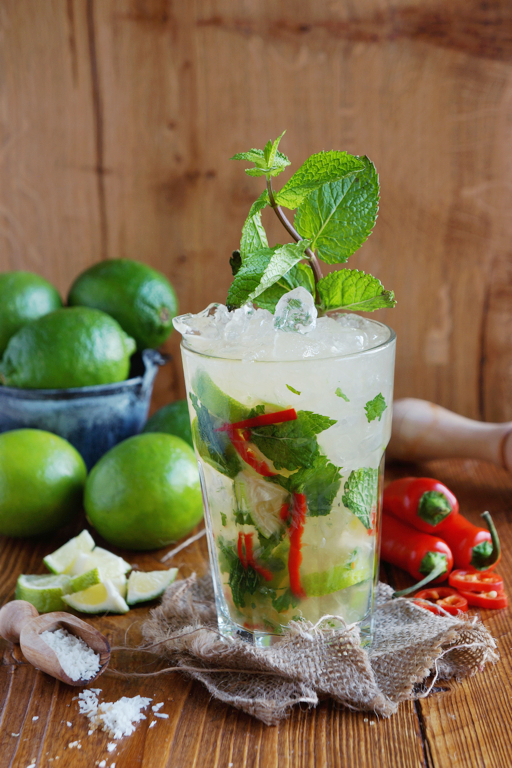 Your photos are beautiful….Like the thought of a gin and tonic even though it is still morning (perhaps later today), yet the Mojito is quite inviting, Plenty of fresh mint in my garden.